Most people have never tried in-ear headphones. They get ear wax on them, so to don’t share well. Wearing them on stage, musicians can hear their own instruments without going deaf. Since musicians use them for performance in-ear headphones are also called monitors, just like the speakers that point toward the band from the front of the stage. Distraction, from airplane noise, office noise, maybe your own keyboard, annoys. Three headphones solve the problem. Most famously, Bose’s active noise canceling Quiet Comfort line and similar products by other makers. Passive noise reduction from sealed over-ear headphones is about 10 dB. In-ear monitors offer passive isolation between 20 and 30 dB. I demoed the Bose phones years ago, and they hissed with the noise cancellation on. The sound quality was neither exceptional nor awful, but was poor for a $300 price. World-class sound quality is available from makers like Etymotic and Westone with in-ear monitors that provide as much isolation as active noise canceling models. But in-ear monitors have one major drawback, they go in your ear canal. That means that they can get gross with ear wax, can be painful or itchy, and they can wear out. In my nine years using in-ear monitors I only ever found the foam tips from the manufacturer comfortable. The three-flange silicon tips isolate amazingly, but itch like fire after twenty minutes and hurt like a drill after sixty. The foam tips are comfortable, almost as isolating as the three-flange tips, but cannot be fully cleaned and wear out after three months. The most recent time I wore out a pair of foam tips, I decided it was time to look at the alternatives. I hoped to find, ideally, a comfortable silicon tip with the isolation of the foam tips or an inexpensively replaceable foam tip. It seems to be sort of a niche market, and I failed to find any useful comparisons on the web. So, I did my own. 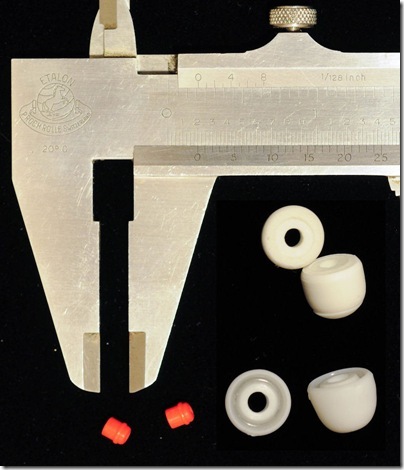 I purchased a sizing kit from Westone, another from Monster, and a pack of the universally-liked Comply foam tips. Testing included a few leftover tips from the headphone’s original purchase, and I included those in the comparison. I evaluated each tip for fit, seal, pain, itching, sound quality, isolation, and microphonics. Fit, seal, sound quality, and isolation are all related. With in-ear phones a poor seal means poor isolation and poor bass response and poor sound quality. Good fit depends on having the correct size tip for your ear. Medium tips from most manufacturers fit my ears well. 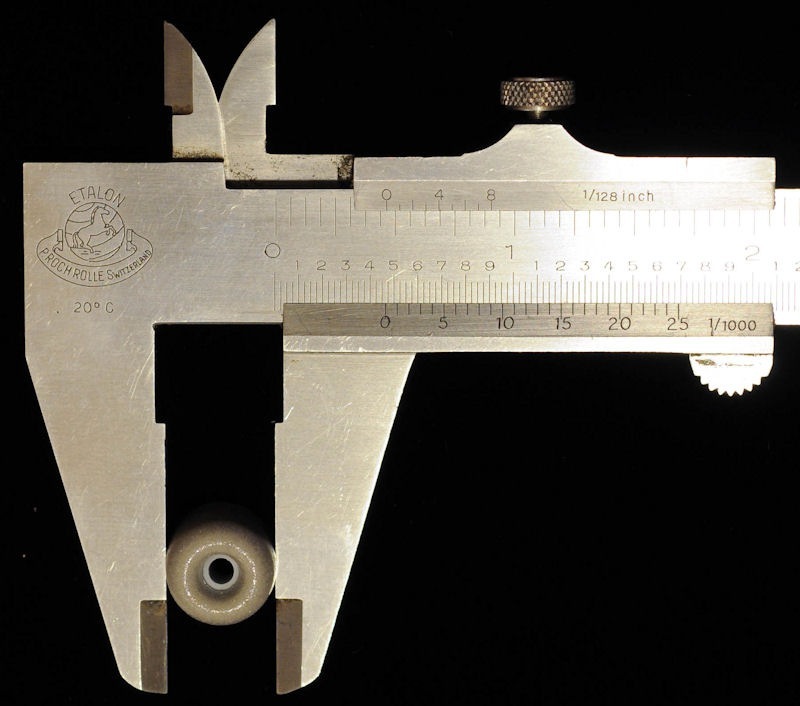 The calipers in the picture below show a base diameter around 0.465 in (1.18 cm). Most of the tip designs are old. Grubby among my grandfather’s shooting supplies, foam and triple flange tips were familiar to me twenty-five years ago. 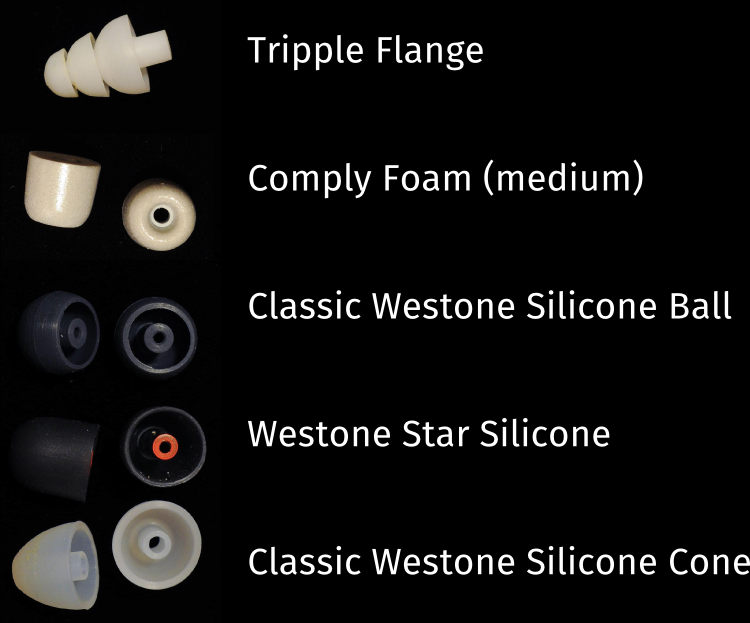 Recently Westone introduced a single-flange tip focusing on good seal and comfort. These, along with other single-flange tips, suffer from awful microphonics. When cables rub against anything, like your arm as you move the mouse, the motion travels along the cables and makes loud popping noises. Single-flange tips have the worst microphonics. The best overall tips for me are Comply’s T-100 PLT medium foam tip. They cause no pain or itching, seal great and offer very good isolation, have low microphonics, and sound very good. Like all foam tips, they will wear out in three months and get waxy and gross. And they are neither the most isolating nor the quietest. The best sounding tips are the Westone silicone three-flange tips, which offer by far the best isolation and by a small margin the best sound. After twenty minutes they also offer crushing pain and infernal itching. The three-flange tips have a place in my kit, but I don’t use them long. 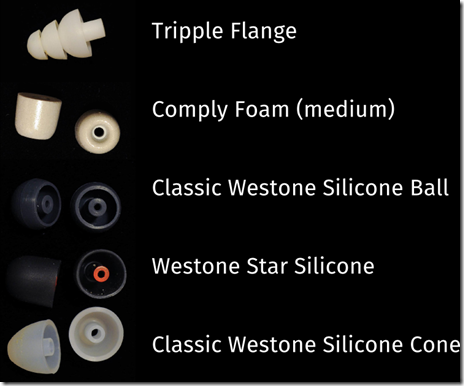 Westone’s single flange tips are silicone, and are comfortable. My notes describe the itching from Westone’s silicone three-flange tip as extreme. After that, finding any silicone tip bearable was a surprise. The Westone Star tip is comfortable. It has poor microphonics, and poor isolation; it has no place on an airplane or a noisy office. On the other hand, Star Tips are cleanable and provide some isolation, so they are candidates for the gym. These also have a place in my kit. The rest of the tips are unsurprising. Everything from Monster had poor isolation and had distracting microphonics due to a poor design. All of the other fitting foam tips are acceptable, but none are as good as Comply’s. All the other silicone tips are unacceptable for me, too painful, too itchy, too microphonic, and sound too poor. The results for all tips that fit reasonably well are in the table at the end. I tested these tips with an hour-long playlist from mixed genre, seven songs in all. It starts with D. Barenboim/Berliner Staatskapelle recording of Beethoven’s Symphony 9, included to show dynamic range of symphonic instrumentation. The next two songs have typical mid-pitch-heavy pop songs including Adele’s One and Only off her album 21, and Erica Badu’s Four Leaf Clover from Baduism. Next, Erica Badu’s Rimshot shows the performance with an extreme deep bass opening line. Sweet Jane from the Cowboy Junkies is more typical pop. A mid-heavy but delicate sound and detailed sound from Miloš Karadaglić’s album Mediterráneo with his performance of Granados’ Danzas españolas, Op.-No. 2 Oriental. Finally, a very detailed song from Rush, The Necromancer off their album Caress of Steel has shown the weaknesses of many sound systems. I chose an hour-long playlist because in my experience in-ear monitors often lead to such itching and pain in the ears that I want to claw them out of ears screaming after forty minutes. Monster produced the only foam tips I avoid. To fit my earphones you put the tiny red rubber rings around the earphone and then slide the tip over the top. The result was poor isolation and poor microphonics. My wife put me onto Bloglovin for those who follow with an aggregator. If you like, Follow my blog with Bloglovin. Finally, I have had no contact with the makers of these products, and I wasn’t compensated or paid in any way. Quite the contrary, I bought all the equipment reviewed here.